The image is crisp, almost crystalline. The light is bright and even. Somewhere in the background, off-camera, heavy machinery whirs. The shot holds at a slightly high angle on a patch of corn leaves. After a few moments, the leaves start to crumple, and the front end of a combine harvester pushes into frame. The machine passes through, and the camera holds steady, revealing nothing but bright blue sky, black specks of debris dancing against clear light. A cold, authoritative voice gives a dateline—Nadrensee, Northeast Germany. June 29, 1992—and tells us a story: "Two farmers discover something lying in the corn. On closer inspection, they recognize two human bodies. They drive towards the village and look for help. Behind them, the field is in flames." These opening moments of Philip Scheffner's Revision give some hint of the shape of the documentary investigation to come, and a feel for this movie's curious purity. A reexamination of this pair of killings that took place nearly 20 years ago, it is a film about the aftermath of unpredicted, but predictable, violence. It demands that we look and listen as assiduously as possible at the facts before us, and then shows how they change, forcing us to look and listen again. Obsessed with borders and divisions, Revision pushes against the frames through which we perceive reality by imposing its own deliberately arbitrary ones. Its obsession with boundaries is introduced, appropriately enough, by questioning the notion of beginnings. Scheffner asks nearly every participant in the film exactly how they would begin their version of the incident at its center, flagging the conditional nature of each testimony at the outset. Throughout, Revision maintains the radiant whiteness and pristine sound recording that characterize its opening scene, bathing the small part of the world onscreen in a light of truth no less brilliant for its acknowledged contingency. By the time Scheffner is on the scene, more than 15 years after the crime, the case is closed, and all of the details that German judiciary has cared to allow into this sparse account have been filled in. Seven years after the shooting, the court acquitted the two men responsible, hunters from Frankfurt who were visiting the area with a guide. The hunters claimed that they had mistaken the men found dead in the field—to the court, unidentified Romanian immigrants who had snuck across the nearby Polish border illegally—for wild boar. This defense was upheld despite the fact that neither man reported the shootings nor made any kind of attempt to retrieve the creatures they supposedly took for game. We do not learn the verdict until fairly late in the film, by which point it is obvious that the court's conclusions are absurd. On top of his narration of the pitiful official inquiry, Scheffner has layered his own more robust investigation. Through conversations with experts, lawyers, and witnesses, and his own fastidious re-creation of visibility conditions on the day of the shooting, Scheffner proves rather conclusively that the state made no serious effort to probe the killings. Following every significant new finding, Scheffner returns us to the cornfield and the narrator tells the story again, incorporating the new facts and giving new emphases to the old ones—one type of the many different kinds of revisions the film undertakes or depicts. The reasons for the German government's uninterest in the case are partly explained by the identities of the victims, which were so irrelevant to the state that their names never appeared in court documents, and their families were never notified of the verdict. These two men and their survivors—their families most directly, but implicitly all immigrants to Europe—are at the heart of Revision's ethical and aesthetic project. 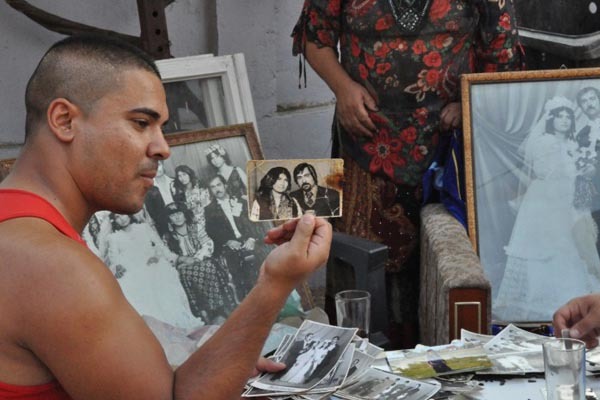 Eudache Calderar and Grigore Velcu were both ethnic Roma who had been working illegally in Germany since the economic crisis that followed the overthrow of Ceaucescu. On the night in 1992 during which they were killed, they were both returning to Germany from respective trips home. The conversations with Calderar's and Velcu's families that dominate much of the film, and, significantly, begin our acquaintance with the case after the narrator's overview, give shape to these men's lives, restoring the dignity denied them in the trial of their killers. In personalizing the crime, Revision does not attempt to turn a public story into a private one. The experiences related by the Velcus and the Calderars underline the sinister context in which the killings happened. Early in the film, the narrator furnishes a statistic compiled by the NGO Fortress Europe: between 1998 and 2009, nearly 15,000 immigrants died along European borders. Taking place at Germany's northeastern border a few short years after reunification, the shooting occurred in an atmosphere of a particularly heightened and violent xenophobia. In one of the film's few digressions from the facts of the incident and the lives of those embroiled in it, the film delves into a neo-Nazi-led riot that took place outside a refugee center in nearby Rostock just a month after Velcu and Calderar were killed. Following the riot, which area police made no real attempt to stop, the German government simply added further restrictions to its immigration policy. In this light, the cruelest revision that the film observes is the one undertaken by the European Union: if Velcu and Calderar were alive today, they would be citizens of the E.U., free to work and live within Germany. Throughout the 1990s, Scheffner was a member of dogfilm, a Berlin-based experimental media collective that produced associative, collage-based documentary videos. His two more recent feature films, The Halfmoon Files (2007) and The Day of the Sparrow (2010), are, like Revision, haunted by absent subjects. The Halfmoon Files centers around a voice recording of a Punjabi solider in the British Colonial forces made in a German POW camp during World War I. The Day of the Sparrow is an attempt to register the impact of German military involvement in Afghanistan on the lives of ordinary Germans, to pry apart the difference between being "at war" and whatever it was that Germany was doing in the Middle East. Like Scheffner's work with dogfilm, both are films made in a now-familiar essayistic idiom. Organized around the singular voice of a self-conscious author, they pull at a few different loose threads in the official history and stitch them together to form a truer, but still elegant, tapestry of fact. The killings that Scheffner investigates in Revision have the makings of one such thread, but here there are no others to braid them with. While the film takes great pains to situate the killings within a context of recent European immigration struggles, Scheffner seems uneasy with the idea of subordinating it to a larger story and once again overwhelming their memories with the necessities of history. More than that, it is obviously important to him that this story be told by those it directly affected rather than yet another outside arbiter of significance. Consequently, in Revision, Scheffner adopts the participatory, interview-centric mode whose faith in direct testimony the singular authorship of his essay films was designed partly to dispute. The film's emphasis on the Velcus' and the Calderars' memories allow the secondary victims of the killings to narrate the story on their own terms, revealing a gulf between their understanding of the meaning behind shootings and the official version. Like the repeated emphasis on the question of beginnings, this gesture insists that knowledge and memory be situated within particular experience. Scheffner is careful to distinguish among all the different versions of the story, separating them sharply with black leader, and arranging them so that they overlap, casting shadows and leaving gaps; a series of contingent, competing stories that do not add up to an objective, supposedly complete version. Scheffner doesn't try to make himself invisible. He includes in the film many of the little negotiations that surround the interview process, the typically unacknowledged agreements between interviewer and interviewee that delimit what we see on screen. We frequently hear him speaking from behind the camera, and his hand is visible in the sharp cuts and unlikely transitions that characterize the editing. Calling into question the choices dictated by his own perceptions, he shows the film to be one more layer of debatable narration waiting to be cast into doubt by new accounts. Revision is as concerned with who listens as with who speaks. Scheffner does not exactly "interview" anyone. Rather, most of the testimony is presented in audio recordings that Scheffner had made with participants prior to shooting. On screen, they listen to their earlier accounts, Scheffner encouraging them to step in to correct or refine their previous statements. Only rarely, however, do the interviewees take him up on the offer. Most of these sequences consist of the participants listening carefully to themselves, staring off into some corner of the room with the fixed grimace that accompanies the performance of concentration, occasionally nodding silently to corroborate their own earlier statements. Scheffner has argued that this approach to the interviews makes the film's participants their own interlocutors, undermining the principle of a disinterested third party on which the kind of testimony given in court, or in most other documentaries, rests. Rather than asking them to once again translate their lives for an audience that has demonstrated more contempt than curiosity, the film allows the victims' families and their contemporaries to legitimate their own accounts of themselves. This is a courtesy he extends to every witness here, including the hunters' lawyer, the closest thing to an onscreen adversary. With this technique, Scheffner leaves too little rope for anyone to hang themselves, thus modeling an alternative to the forms of justice practiced in the court and much non-fiction media, one that is more responsive to all the slippages that occur when memory is fixed into word, and word into fact. Like everything else in Revision, the epistemological relativism is qualified. Though the film calls every final word into question and refuses to produce its own, it allows that there are things that can be proved. Scheffner introduces the prosecution's medical examiner to supply forensic evidence that casts the hunters' defense into doubt and suggests that one of the victims survived the shooting and was left to die in the eight hours between their departure and the arrival of the police (and which the court chose to simply ignore). Late in the film, there is an incredible sequence in which Scheffner precisely recreates the visibility conditions on the night of the shooting. Consulting with an astronomer, he calculates the time difference over the years that have passed. He brings us to the crime scene at the right moment and, with DP Bernd Meiners, adjusts the zoom and the shutter to mimic the optical effect of the binoculars through which the hunters admitted they were looking, directly demonstrating for the viewer the basic implausibility of their claims with a complete transparency of technique. Scheffner's tweaking of the usual practices of the participatory, investigative documentary constitutes a substantial re-imagining of its possibilities, and an attempt to carve out a kind of radical center for political documentary. Whereas most critiques of the form's ideology take place on a theoretical level, illustrating all the things that it cannot show us, Scheffner has devised the practical adjustments that such criticism demands, as though trying to determine precisely everything that it can. The attempt is far from complete, but it opens up a tantalizing avenue of exploration. The film's primary visual motif is the window. Nearly everyone who appears onscreen is introduced by a shot of the one in the room in which they speak. The metaphor of the window has traditionally served as the most naive conception of documentary, a crystal-clear view of objective reality. Scheffner revises this metaphor too, making it a potent symbol of what he is doing in Revision. He shoots these windows a few steps back into the room, often from a low angle, showing more of the frame and the wall that surrounds it than the world beyond the glass; foregrounding everything that renders its view arbitrary and incomplete, and that mark its status as a border between inside and out. But nevertheless, the world is out there, a small part of it visible and comprehensible at this distance from the glass. Revision does all of this without displacing the primacy of Velcu, Calderar, and their families. Its final sequence is a long travelling shot that follows one of Velcu's daughters through the graveyard in which her father is presumably buried, the film insisting to the end on specifically memorializing these two dead men. In his attempt to determine what exactly documentary can show us, Scheffner never forgets that his first responsibility is to determine what exactly it should.